1. Set up a double boiler. Set up a 4-quart saucepan, filled halfway with water, into which you can nestle a 3-quart stainless steel bowl. Bring the pot of water to a boil over high heat while you're preparing the custard base. 2. Cook the base. In a small saucepan over medium heat, warm the half-and-half until it steams. Spread the chocolate into a thin layer over the bottom of a bowl, then pour on the warm half-and-half. Stir until the white chocolate has begun to melt. In the 3-quart stainless steel bowl, whisk together the egg yolks and sugar until thoroughly combined, then whisk in the chocolate mixture. Reduce the temperature under the pot of water to maintain a gentle simmer. Set the bowl of custard base over the simmering water and whisk frequently, scraping down the sides of the bowl regularly with a rubber spatula, until the mixture thickens noticeably, about 5 minutes. The custard is sufficiently cooked when it reaches 180 degrees on an instant-read thermometer. (You can also test it by dipping a wooden spoon into the custard, then running your finger through the custard: if the line holds clearly, the custard has thickened sufficiently.) For the finest texture, pour the custard through a fine-mesh strainer into a similar-size stainless steel bowl. 3. Cool the base. Fill a large bowl halfway with ice. Nestle the custard into the ice and whisk regularly until completely cool. Refrigerate if not using immediately. 4. Finish the base. 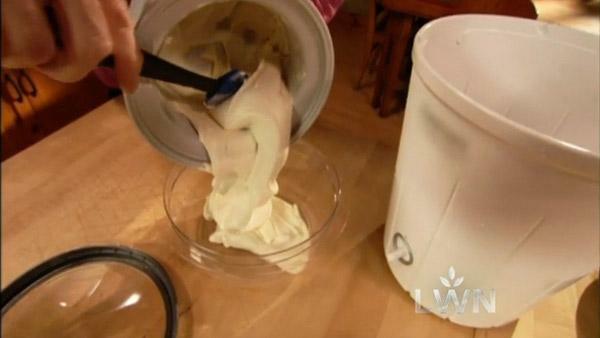 Stir the heavy cream, Xtabentun and vanilla into the base. Freeze in an ice cream freezer according to the manufacturer's directions. Scrape into a freezer container and freeze for several hours to firm.